My name is Marjane Thompson, and I know the language of the Q’rai better than any human alive. I have been on the Q’rai’s world for eight years, and I have yet to use it. The Q’rai language is at its most poetic when describing the ocean, and I’m the only human being who can appreciate it. I savour the nuance between the water stirred by a surface current and the water stirred by a gust of circular wind. I know the words for the green water rich with brine jelly and for the red water during a sunfish bloom. I roll my tongue over the suffixes added for the differences in salination and the tonal variances for the sea in the seven seasons. As I’m falling asleep nights, I whisper to myself oulai’ma’oulai, the word for your share of the ocean you carry in your heart. I would like to say that it is not for want of trying, but unfortunately that’s not the case. We chose this island for planetfall because it is so secluded, well outside of Q’rai shipping lanes, two hundred miles from the nearest coast. We touched down smoothly on the bonemeal sand near a copse of dense vegetation, tipped the lander on its side and covered it with sand. We built our first camp immediately in a cave nearby. That first night we all sat around a heater, though we were well warmed by our achievement. We were each one of us specialists in exploration and first contact. This was our job, but our hearts still leapt like Cub Scouts on their first night out. Nordin, the exobiologist, got out some bottles of clear Swedish liquor, and Halberstadt, the structurist, passed around freeze-dried chunks of his country’s ceremonial fruitcake. I felt good that night. I had already established a working repository of Q’rai phrases which Peman, one of the two comm engineers, had pulled for me from the planet’s infosphere. I went to sleep dreaming of meeting the white giants, of bowing to their fin-like feet, with the words ma’alo, Greetings, and ne’oulau lo nahua, We mean you no harm. The next morning I watched the team go to work like an ant colony in spring. We found that the vegetation was easily pulled apart to make room for our inflatable living quarters. Nordin and Liz Wilson, our nutritionist, scouted the near part of the island for water and edible materials, and came back with baskets full of lettuce-like leaves, large sugary berries and a type of crustacean they assured us was a good source of protein. Peman and Rictor set up the energy grid, the perimeter systems and the communications soak that would allow us to tap into the sphere’s maritime chatter. Charity Lee, our “physical security,” readied the trapping and defensive gear, and then helped Halberstadt with the construction of the shelters. I practised my grammar. We knew what we were dealing with. The Q’rai were essentially friendly, a coast-dwelling species with one foot in the water, intelligent, large enough not to have to fear any other species, advanced in culture if less so in technology. They built elaborate, elegant sea-going vessels, farmed the ocean for food and amenities, traded, communicated over submerged planet-spanning information systems. Perfect neighbours. We learned what we could. We dug in and studied them, and within the first few days Rictor had found a way into the depth of their systems. It was fascinating, the shimmering displays of an alien culture and economy, and we were all glued to the screens, but I should have known back then that this did not bode well. Days turned into weeks. I complained to Nordin, who was by rights the leader of our party, that we should concentrate on our first contact, that we should build a boat and journey to the nearest Q’rai colony, but he said that the plan had changed. While I was steeped in the intricacies of tenseless verb constructions, Rictor had developed a scheme. Our computers were so far beyond Q’rai capabilities that their cryptography cracked open like a fortune cookie under our scrutiny. Almost as a game, Rictor had changed some less significant digits on a few thousand secure transactions, diverting the proceeds to an ersatz chequing account. Our little band now had credit. It was Halberstadt who joked, “Can we order some pizza now?” Only Peman laughed. Everyone else just stared at him. “We’re the aliens,” I felt obliged to say, “remember?” I don’t think that anybody heard me in the erupting discussions. It was decided that we would give it a try. The next day, Halberstadt went to work with the native designs Peman had pulled out of the infosphere. Like the Q’rai, he used the light but amazingly strong tubes of a sort of mangrove to construct a long pier into a lagoon on our north side. He also built two buildings of sufficiently native character. “Warehouses,” he said, when questioned why. I fabricated boards with typical Q’rai harbour signage. Whom that was going to fool I wasn’t sure, but it would only have to hold up until they landed. Then we would make contact. Ma’alo, Greetings. Ne’oulau lo nahua, We mean you no harm. We drew up short lists of things that would come in handy, and it was like catalogue shopping for Christmas. We ordered tools with uses that weren’t fully understood. Spices. Fabrics. Bottles of makh, a popular narcotic apparently made from brine jelly. Building materials. Blankets. Fuel cells. Beautifully crafted weapons, which I was sure were ornamental. Items of unknown function that, if I had to take a stab, I would have described as novelty items. We ordered, paid with our ill-gotten gains, and had it all shipped to our coordinates, as simple as that. It was about a week later, in the late afternoon of a hot day, when the Q’rai arrived, and I was sleeping. Wilson and Rictor were on shift on the beach lookout, and they were supposed to alert the camp, to wake everyone up, to come and get me to go out there and make contact, but they didn’t. Later, when we reviewed the footage we had trouble following their reasoning. They said that the sight of an alien ship sailing into the bay and landing at our dock was mesmerizing, overwhelming. They said they simply couldn’t think of anything they were supposed to do. The first humans to lay naked eyes on intelligent aliens, they found themselves unable to do anything but simply watch the white giants step ashore and slowly unload the wares from the ship. “So what,” Rictor said. “We’ll just do it again.” The rest of the crew agreed. Then they started to open up their presents. We tried the food items and the spices, and got high on the makh. We fought with the ornamental weapons. We carefully sorted and stored the fabrics and building materials, and examined the tools and practical items. And we played with the Q’rai toys. It was a night to remember, and it lingered into most of the following week. Then something happened that I thought was only of passing interest at the time, but it turned out to make a big difference. Charity Lee told us she was pregnant. I was speechless. Ou’ma’ee, the Q’rai call it when they enter a period of gestation, and they change their colour and gender for this period of about a year. Ou’ma’ee meant the flow of new water into old. I don’t know how Lee accomplished ou’ma’ee in the short time since waking from cryo, not least because we were all supposed to be on contraceptives, but the news immediately changed the behaviour of almost everyone around her. The only phrase that could do it justice would be “nest-building.” The Q’rai don’t have a word for that. Halberstadt built Lee a separate living quarter, replete with an extra room for the new arrival. Wilson made small clothes from some of the softer alien fabrics. Nordin changed our meal plan to make sure there was enough fibre and folic acid to go around. Rictor ordered more stuff. More stuff arrived, and I was asked not to be in attendance on the beach when it did. The group felt that now was not a good time to be meeting aliens and to face the unknown consequences of that action. Who knew, we might be forced to give up our outpost and leave the planet. “Our onboard cryo isn’t rated for pregnant women,” Nordin informed me matter-of-factly. Months passed. We built rooms into the bonemeal underground and stretched our walkways into the megaflora around us. While Lee’s belly grew, Peman’s and Rictor’s leeching systems got better and better, until we had access to virtually every aspect of Q’rai enterprise and more wealth than we could spend. Sampling the Q’rai culture via mail order was marginally better than learning nothing at all, but I still felt that we become a q’uat — a lamprey-like creature that attaches itself to the gills of the docile leviathans the Q’rai call i’namaa, silver whales. Lee’s baby was born in late Nau’q’aa, the season of warm, skylit nights and the sunfish bloom. Her name was Evy, and she was the first human to see the light of her first day on another planet. She came out with Nordin’s unfortunate nose. Lee refused to talk about it. Within a week of the birth, Wilson was also pregnant, Halberstadt the gleeful culprit. It has been a long time, but it is Nau’q’aa again, and the nights are hot and light, and the sea is red with spawning umou’e. 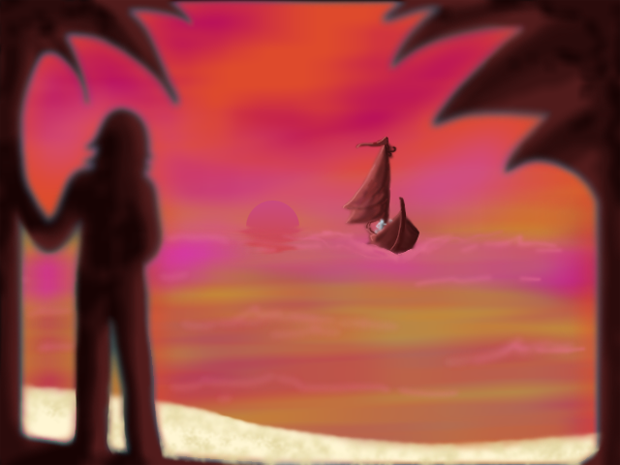 The island is a pulsating little human colony, and the Q’rai are still delivering makh and fuel cells to the beach, oblivious to what whelp they are feeding at their bosom. And I sit on the beach on the nights when I’m allowed out, when we don’t expect a shipment. I look back at the forest and see the lights, and think that I have spent eight years watching this grow, eight years being sidelined in this tumorous, money-making, baby-making, creature-comfort generating operation. All because we are afraid. And we are too comfortable. And I, Marjane Thompson, fluent in all twelve Q’rai dialects, was not ready to simply walk out during delivery time and speak up for my human brethren. Tonight, Rictor came down to the beach to sit next to me. He placed two bottles of makh into the bonemeal sand between us. I acknowledged his greeting but refused the drink. He grinned at me. I looked out to sea. I had heard it before. I humoured him and opened the second bottle. We shared a drink. I left him and walked. Under the half-lit sky, along the gentle shore. To where I had hidden the boat. I had spent weeks making it, a craft that would be able to negotiate the reef and the waves beyond. I had made a sail, and I had stocked the boat with food and fuel cells and blankets and water. I had made oars and a rudder. I had made a map. The map charted the ocean from here to the nearest coast, all two hundred miles of it, from the water stirred by the surface currents that would carry me, to the water moved by the circular winds that would billow my sail. I would name the streams with differences in salination; I would sing the tonal variance for the sea in Nau’q’aa. And I would carry with me my share of the ocean, oulai’ma’oulai, the most beautiful word of them all. And I will practise my pronunciation. Ma’alo, Greetings. Ne’oulau lo nah’u, I mean you no harm. Martin Ivison is a German-born Canadian living in Vancouver, BC. His publishing history includes four albums of songs for Sony/BMG (as Instant Karma).